If mentioning “64-bit” conjures up images of large, bulky mainframes running sluggish, industrial software, then you are in for a pleasant surprise. I have been using Ubuntu 10.10 64-bit on a Gateway LT2114U netbook for over two years now, and the results have exceeded my expectations. 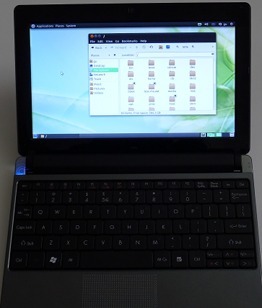 Operation is quick, snappy, reliable, and it outperforms Windows XP Home (32-bit) and Windows 7 Pro (32-bit) on the same netbook. Running Ubuntu lead to a number of interesting discoveries, so here is an article describing my experience.